Ted Nagle was born at Hay River (map) in 1898 and, for the first four years of his life, lived at Fort Resolution. Ted’s father, Edward Nagle, with partner Jim Hislop, operated 22 trading posts on the Athabasca, Slave and Mackenzie Rivers. The Nagle family left the north for Edmonton in 1902 but Ted returned in 1926. He had taken a job with Consolidated Mining and Smelting (a company that later changed its name to Cominco) and was sent north as a prospector. One of his major discoveries in the Northwest Territories was the galena deposit on the south side of Great Slave Lake. This discovery, that eventually became the Pine Point Mine and town, wasn’t made by chance, Ted’s father had told him where to look! In 1898, Edward Nagle was operating the Hislop and Nagle trading post at Fort Providence when hundreds of men and women came through the community on their way to the Klondike Gold Rush. Edward Nagle was swept up in the frenzy but instead of going out looking for gold he asked the Dene who traded at his post to bring him any shiny rocks they found. One day a group of Dene brought in a rock that Edward Nagle recognized as galena, a lead ore that’s often found in association with significant gold and silver deposits. The Dene told Edward that the rock came from the Ile du Mort area along the south shore of Great Slave Lake. They also told him that in the old days, when the Dene had only muskets, they would collect rocks from the mainland opposite Ile du Mort, melt them down, and mold their own musket balls! Edward staked claims in that area, dug pits to collect samples and sent these south for analysis. He was very disappointed when the results came back; the galena contained only lead and zinc, metals having little value back then. He gave up on the idea of being the owner of a profitable gold mine and went back to the business of trading furs. Twenty-eight years later, with the value of lead and zinc on the rise, Ted Nagle hiked into the site on the south shore of Great Slave Lake where his father had staked claims only to find that a group calling themselves The Boston Syndicate had recently staked most of the area. Ted Nagle dug a number of pits and found that this ‘syndicate’ had missed a large part of the galena deposit. He then claimed these on behalf of Consolidated Mining. With two companies having claims on portions of the galena deposit an attempt was made at an uneasy partnership between Consolidated Mining and The Boston Syndicate, which by then was called Atlas Mining. 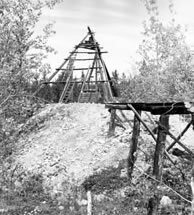 Consolidated eventually gained total control of the property but it wasn’t until a railway was built to the south shore of Great Slave Lake that a mine, and a town site, was developed in the early 1960s. In 1988 the mine closed and all buildings at the mine and in the town were removed. Pine Point's original head frame, dating back to the 1920s. Ore samples from this particular pit ran as high as 50 per cent lead-zinc.